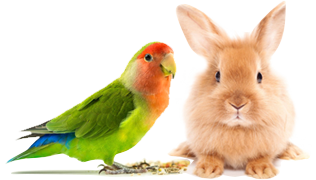 Your Bird's Health – Pet Birds by Lafeber Co.
All companion birds should visit an avian veterinarian at least once a year for a well-bird checkup. Just as you would take a dog or cat to the vet annually, a bird needs his own doctor, too. An avian veterinarian is one who specializes in birds. Not all vets are qualified to work on birds, so you may have to look around to find one. Usually, avian vets are board certified by the Association of Avian Veterinarians (AAV), but not all of them are — if the doctor has an established avian practice, then board certification shouldn’t be a deal-breaker. How long has the doctor been working on birds? Ideally, he or she should have extensive experience working directly with birds. Does the doctor have many patients that are of your species of bird? The answer should be yes, unless you have a very rare type of bird. Do the veterinary office take emergencies; does it have after hours availability? Some offices will only take emergencies if your bird is already a patient. How much do they charge for a checkup? Cost for a general workup depends largely on the region you live in and what you are having done. Expect to pay between $150 and $500. It’s worth every penny! How long does the veterinarian spend with each patient? Some doctors only spend a few minutes with a patient. It’s nicer to have a doctor who isn’t going to rush. Does the veterinary office quarantine sick birds? Ideally, the office should have a separate area for ill birds. It’s a good idea to visit the office before you bring your bird there, if possible. Is the office clean? Are there people in the waiting room with birds? Is the staff friendly and helpful? For some people, the veterinarian’s bedside manner is as important as experience. At the well-bird checkup, your bird will be weighed and the veterinarian will do a physical exam. Usually, the veterinarian will take cultures and draw blood to send to a lab for testing for a variety of bacteria, viruses and fungi. Your bird may get a vitamin or mineral injection as well. This is a good time to ask the vet to groom your bird if you’d like his wing feathers or nails trimmed, or his beak groomed. Standing Water Birds have been found drowned in water glasses and even dog bowls. Play it safe and keep toilet lids down, Jacuzzi tubs and fish tanks/bowls covered, and don’t let dishes soak in the sink while your bird is out of the cage. Ceiling Fans Take down your ceiling fans, or make absolutely sure that they are turned off whenever your bird is out of the cage. You may think that your bird can’t fly that high, but you’d be surprised! Lead Stained glass, fishing weights and old, chipping paint contain lead, which can be deadly to your bird. Keep these items far from your bird’s reach. Scented Candles, Potpourri & Air Fresheners Anything that scents the air using chemicals can be very dangerous for your bird. You can get the same effect by boiling cinnamon sticks and scented teas — just don’t leave them on the stove when your bird is loose! Nonstick Surfaces Nonstick surfaces found in cookware, space heaters, popcorn makers and various other appliances emit toxic fumes when heated that can kill birds without warning. Before you use an appliance, ensure that your home is well-ventilated (e.g., open windows and screened doors), and temporarily locate your bird to an area of your home with a separate airspace. Swap out your nonstick cookware with stainless-steel cookware. Hot Pots & Pans A pot full of boiling water might look like a great bathing spot to your bird — very bad! And worse, the pot may be full of hot oil or sauce. Keep your bird away from the kitchen when you are cooking. Glass & Mirrors A flighted bird may think that clean glass and mirrors are empty space and can be seriously injured or killed by flying into them. Sticker your glass and mirrors, or keep them dirty! Open Windows & Doors Many pet birds that fly away are never recovered. Keep your window screens intact, and be careful when you go in and out of the house. Wires Wrap and put away all wires — some pet birds find cords and wires appealing and chew on them. New Carpeting New carpet emits fumes that can be deadly to birds. If you are having new carpet installed, have your bird stay with a friend/relative or board your bird for a few days to give the carpet time to air out. Fumes Sometimes you are unaware of fumes in the air, but may notice your bird acting strangely — perhaps you’re firing up your fireplace for the first time that season (in which case the bird should be out of the room!). The bird may become woozy, have a seizure or even lose consciousness. Immediately remove the bird from the area, and ventilate the room. Removing the bird from the source of the fumes may be enough to bring him around. If not, take him to the avian vet immediately. Oil On The Feathers A bird may accidentally get into a household oil, which is incredibly hazardous because oil prevents the feathers from insulating the bird. If your bird gets into oil, the first thing to do is dust him thoroughly with baking flour and then gently wipe the oil off. Next, fill a bowl or the sink with enough lukewarm water to cover him up to the neck, and add some grease-fighting dish soap — just enough to make the water sudsy. Rub your bird’s feathers gently, and take care not to dunk his head! Then dry the bird with paper towels and set him in a warm place to continue drying. Hopefully these two steps should be enough to remove the majority of oil on the feathers; if not, seek professional medical help. Overheating/Heatstroke Birds can overheat if left in a hot area or put into the sun without a shady spot to retreat to. Signs that a bird might be suffering from heatstroke include panting with his beak open and holding the wings slightly away from his body. The bird will also be standing on two feet, as opposed to resting on one foot as when in a relaxed position. Take the bird to a cool area right away and mist him with cool, not frigid water. Place a few drops of cool water into the bird’s beak (without distressing him further). Watch to make sure that the bird regains normal activity. Finches and canaries should always be flighted — these are “watching only” birds that most people don’t handle. Other small birds that live in an aviary setting are often also left flighted, including budgies, cockatiels and lovebirds. Parrots that are “hands-on” companions often have their wing feathers clipped so that they can’t fly away. A proper wing-feather trim should never hurt the bird. Only the lower half of the bird’s seven to 10 mature flight feathers on the wing should be clipped, and these don’t have a blood supply or nerve endings; cutting the tips of these feathers is like a haircut. However, flying psychologically benefits a bird, so you can keep a hands-on companion parrot flighted if you are very careful about windows and doors, and you thoroughly parrot-proof your home, including removing all of the potential dangers that a roaming bird can find. Any bird left outside of the cage should be closely supervised. If you can trim your bird’s wing feathers but not before you have a trained professional show you how. Do not, under any circumstances, try to clip your bird’s wing feathers unless you have been shown the proper technique and you are confident you can do it yourself. Your best bet is to take your bird to your veterinarian or a bird store that does grooming. This way they are the “bad guy” and you can come to your bird’s rescue. Also, wing-feather clipping necessitates properly restraining the bird, which can be very dangerous if you don’t know what you are doing. You can actually stop your bird from breathing if you hold him too tightly around the chest. Let someone who knows how to properly restrain a bird show you how to do it. Birds need very little actual grooming; they do most of the grooming themselves. They bathe themselves when given access to water, and they preen their feathers into perfection. When people say, “bird grooming,” they are referring to clipping the wing feathers, trimming the nails, and conditioning/trimming the beak. A professional should do all of these grooming chores until you know how to do them, with the exception of the beak. Only an avian veterinarian should tend to your bird’s beak. You can seriously injure the beak if you do something wrong, and the beak is very sensitive. Nail trimming can be traumatic for a bird, especially if the bird has to be restrained to have it done. Also, the nail has a blood supply, called the “quick,” and if you cut into it the nail will bleed. You can stop the bleeding with styptic powder or flour. If you are comfortable enough to trim the nails yourself, use a guillotine-style clipper (the same style used to trim a cat’s nails), or one specified for birds. A really great, non-traumatic way to trim nails is the “sneak up” method. Hold your bird on your hand and talk to him in an animated manner to distract him. Then, sneak up on the very tip of one nail and clip it off quickly and then turn around or do something to distract the bird from the fact that you just did that. You can do one nail a day, and, in eight days, you’ll have all of them done. Be careful to only trim the very tip of the nail. Nails that are trimmed too short can be quite painful the bird, similar to if you trimmed your own nails too closely to the live nail bed. A bird’s beak can get flaky and overgrown. This can be the result of a poor diet, but this can also be because the beak is built that way. The beak is made of keratin, the same material as our own nails. An avian vet can “condition” the beak using a file to smooth and shape it, and then oil it to keep it from drying. Again, do not do this yourself! Change In Demeanor A typically active, playful bird that becomes listless and withdrawn may be feeling ill.
Sleeping Too Much A change in your bird’s sleeping habits can indicate illness, especially if the bird is sleeping on two feet with his feathers fluffed up to keep warm. Sometimes an ill bird will crouch on the bottom of the cage. Discharge From The Nares The nares are your bird’s nostrils and are found at the base of the beak. They should be free of discharge. Discharge Or Bubbles From The Beak This is indicative of a respiratory infection. Clicking From The Beak A clicking sound that happens as your bird breathes indicates air sac mites, which finches and canaries are especially prone to. Tail Bobbing A bird that bobs his tail feathers (going back and forth) noticeably while at rest might have labored breathing. Don’t mistake this kind of tail bobbing for the kind that accompanies singing or breathing heavily after exercise. Vomiting Vomiting is different from regurgitating. Regurgitation is what a bird does when courting another bird (or you!) or to feed young. Vomit usually sticks to the feathers around the bird’s face and chest. Lack Of Upkeep An ill bird will usually look unkempt and ratty because he isn’t preening as much. Being Picked On By Cagemates Birds will pick on other birds that are ill, and may even kill the weakened one. If you notice any of these signs, take your bird to your avian vet right away. Just like with illnesses, birds tend to downplay their injuries as well. However, if you’re observant, you will notice when something is wrong. Bleeding If you notice any bleeding or dried blood on your bird, take him to the vet immediately. Birds don’t have that much blood, so even a small bleeding injury can create extreme distress. Leg A leg injury may be quite obvious — you may see the leg hanging if it is broken, or notice a broken toe, or even a toe that has been ripped off (perhaps by another bird or by an unsafe toy). Usually, minor toe injuries do not require veterinary care, but leg injuries do. Eye Eye injuries are common among birds that thrash in the cage due to fear or night frights. Also, other birds can injure a weaker bird’s eyes. Always consider eye injuries serious. Change In Attitude An injured bird may sleep on the floor of the cage with its feathers fluffed, as if it is ill. A formerly sweet bird may become aggressive and not want to be touched. Similarly, a hands-off bird might suddenly not put up a fight if you attempt to pick him up. If you suspect that your bird is injured, take him to the avian vet as soon as possible. If you can’t get there quickly or you have to wait overnight, put the bird into a “hospital cage” until you can get to the doctor. A hospital cage is used when a bird isn’t feeling well, is injured or is egg-bound (when an egg becomes stuck inside a hen). This is a warm, safe place for the bird to recuperate and rest, and be away from any stressors. You can use a commercial incubator or brooder as a hospital cage — these are great because they regulate temperature and humidity, but if you don’t have one of these, here are directions for a simple hospital cage. Line a 10-gallon fish tank with paper towels. Place a rolled-up hand towel in one end of the tank. Place a heating pad on “low” heat under one half of the tank; make sure that the other half isn’t on the pad. Use a screen to cover the top of the tank. Cover the tank at least 3/4 of the way with a towel so that the cage is a little darker inside and will stay warm. Include a very shallow dish of water — a very ill bird can drown in an inch of water. Include some of your bird’s favorite food, like Nutri-Berries, and something easy to eat, like millet spray. Place the hospital cage in a quiet room. Keep a close eye on your bird to make sure that he looks comfortable and not too warm. If you have one, place a thermometer in the tank to check that the temperature doesn’t go above 98-degrees Fahrenheit. Most feathers do not have a blood supply, but new, growing feathers do, so they will bleed when broken. A new feather is encased in a white sheath of keratin. As the feather grows, it bursts out of the sheath, which the bird either preens off or comes off on its own. Until the feather is fully mature, it still has a blood supply. Be very careful not to cut a blood feather. Sometimes, blood feathers will break and bleed if a bird falls or thrashes in the cage. In this case, you’ll have to pull the feather out from its root to get it to stop bleeding. It sounds barbaric, but if you leave the feather in the bird, it will bleed for quite a while and then perhaps become infected. Not all broken blood feathers cause this kind of tragedy, but it’s better to be safe than sorry. If you can’t get your bird to an avian vet to remove the blood feather, you can do it yourself. Restrain the bird properly in a towel, making sure that you aren’t preventing the bird from breathing. Next, locate the bleeding feather, which is usually on a wing or tail feather. Using needle-nose pliers, grasp the feather firmly close to the root, and pull it out — don’t yank — just pull hard enough to take it out. Then you can swab the area with a weak solution of hydrogen peroxide. Molting is the process by which a bird replaces old and worn feathers with new feathers. This doesn’t happen all at once. Feathers are replaced on all parts of the bird’s body simultaneously, a few dozen at a time. You won’t see any bald patches on your bird, but you will notice quite a lot of feathers on a bottom of the cage and around it, and you will also notice “pinfeathers” peeking out from between the bird’s plumage. These white pins are feather sheathes made of keratin, and they protect the new feather until it’s ready to emerge. Molting usually happens seasonally, once a year, but it can sometimes happen twice a year, and birds can also go into a “soft molt” where they molt all year long. Molting time is determined by the time of year or how much daily light the bird receives. Molting can be a stressful time for a bird because the feather production can take a toll on the body, and if a bird is poorly nourished, the bird’s health can seriously suffer. Molting birds need extra protein and vitamins. A molting bird also needs more rest than usual. It might be a little cranky, too, which is understandable because the new feathers can be itchy. Canaries will stop singing during molting time. Some birds don’t change attitude at all during molting, and may actually want you to help gently remove some of the itchy pinfeathers that emerge around the face and head. These are areas the bird can’t reach these by itself and would usually have a mate help remove the sheaths. If your bird lets you, gently pinch the very tips of the sheathes to help the feather emerge. The bird may also want to be gently scratched on the head and face as well. Some hens (female birds) will lay eggs with or without a mate present, and some will even lay them without a nest present. Cockatiels and lovebirds are notorious for this behavior. Seeing an egg on the bottom of the cage can be distressing for a bird owner. What do you do about the egg? It seems cruel to take it away, but actually, if the egg is infertile (which it is if there’s no male present, and often even if there is a male present), then it’s not so nice to allow the bird to sit on the egg for weeks in attempt to hatch it. Also, the presence of one egg will prompt the bird to lay others to create a “clutch.” You can allow the “mom” to sit on the egg for a few days, but then you should remove the egg and all traces of a nest that she may have tried to build. Egg laying is a perfectly normal behavior, but it’s not to be encouraged simply because it takes a large toll on the bird’s body. Eggs leach calcium from the bones, and egg-laying hens need a lot more nutrition — especially calcium and protein — than non-laying hens. You can discourage egg-laying by decreasing the amount of light your bird gets a day to less than 12 hours and by removing all “nesting” material, including paper. Sometimes, if a bird isn’t in her prime or if she has recently had too many eggs, she can become “egg bound.” This is when an egg is stuck inside of her, usually because it is malformed, soft, or because the hen is too weak to pass it. You may notice that her abdomen is distended and that she’s on the bottom of the cage, fluffed up and possibly distressed. Her droppings may be large and watery, or she may not have droppings at all. Egg binding is a potentially deadly condition that requires immediate veterinary care. If you can’t get her to the vet right away, place her in a warm hospital cage and give her two drops of olive oil in her beak and several drops in her vent (where the egg comes out). Be very gentle and be careful not to aspirate (choke) her with the oil. The oil may lubricate the egg and allow it to pass. Heat is also critical to this process, so make sure that the hospital cage is around 98- to 99-degrees Fahrenheit, and that it is well ventilated. Moisture is important, too, so place a shallow dish of water in the hospital cage as well. Keep an eye on the hen to make sure she’s okay, but don’t disturb her too much. Give her a chance to pass the egg. Many people “hobby breed” their birds, and this is quite accepted in certain species, such as budgies, canaries, doves, pigeons, finches, lovebirds, cockatiels, Indian ringnecks, and some other species that come in a variety of mutations and are relatively free-breeding (easy to breed and raise). However, breeding does come with some risks, and it’s important to be aware of them before you undertake this task. Any bird breeder will tell you that breeding birds actually costs more than you make — there are veterinary bills, feed costs, not to mention the time it takes to care for the parents and chicks. Breeding birds takes more than just putting a nest in the cage with a pair of birds. There’s actual know-how involved, a lot of which comes from actually doing it. Fortunately, there are hundreds of bird clubs to offer you mentorship and guidance should you choose to breed your birds. Do not, under any circumstances, try to set your birds up for breeding without consulting an expert, someone who is experienced in the hobby who will guide you in the various details you need to know before you even begin, including proper pairing, cage size and placement, next box size, diet, and so on. There are a lot of details to know before you begin! There are also some serious risks to both parent and chicks. Know what you are getting into before you make your final decision. Bird breeding can be very rewarding, but it’s not without its pitfalls. Quarantine is traditionally a period of 40 days in which a new bird should be separated from other birds in order to make sure that the bird is healthy. Many deadly avian diseases are easily spread through the air or close contact, so it’s important to separate new birds from established birds. Many bird keepers cut the time down to 30 days rather than 40, and find this to be as effective, especially if veterinary tests are pending. Usually, once the veterinarian clears the bird, it’s fine to introduce him to your flock. Ideally, quarantine should take place in an area that is completely separate from the established birds, such as a separate building, or an area that has a different ventilation system. If that’s not possible, separate them as much as possible. Always tend to the established birds first, and then to the new bird. Change your clothes and shoes, and wash thoroughly after tending to the new bird so that you don’t transfer any possible diseases to your other birds. Birds need a period of solid, undisturbed sleep every night. A bird that is not getting enough sleep can become cranky and even unwell. Most birds do well with 12 to 13 hours of sleep per night. Any less than that and a bird may be pushed into breeding mode, especially in the spring. Birds are photosensitive, meaning that their bodies respond to light to regulate the breeding cycle. This doesn’t mean that 12 or more hours of light a day will automatically prompt your bird into a hormonal phase, but some individuals are more sensitive to light than others. If your bird’s room is going to be disturbed in the evening, consider relocating your bird to a designated “sleep cage” placed in another room where the bird can have some quiet time. Stick to a routine, and put your bird to bed at about the same time each evening, and wake him up at the same time each day. Birds are creatures of habit. All of this being said, birds are also adaptable creatures that can live happily with an unusual routine. Birds will “cat nap” when tired, so don’t fret too much about sleeping habits. Just do your best. Most households containing multiple species can remain peaceful, even those animals that seem at odds, like dogs, cats and birds. But there are hazards to keeping various species together. Here are a few of the potential issues in a multi-pet household. Dogs Birds and dogs can live peaceably depending on the individual dog. Some dogs actually make friends with birds, and some consider them part of the household, another family member to be protected. However, no amount of training is going to teach some dogs that birds aren’t squeaky toys or food. Some breeds, like terriers, sighthounds and sporting dogs are hardwired to view small, fast moving objects as prey. It’s tough to unravel a dog’s instinct. If your dog seems interested in your birds, your best bet is to keep the two pets completely separate. Remember, animals change as they get older. A puppy that constantly tries to get to the the bird might grow into a dog that doesn’t care about the bird anymore. A puppy that doesn’t notice the bird might grow up into a hungry or playful dog that takes his chances with your avian friend. Cats Cats and birds don’t make great household companions. Most cats have a very strong prey drive and will view small birds as playthings or food. The bigger the bird, the less able a cat will be able to test the boundaries, so small birds are more in danger in a household with cats. However, cats have Pasteurella bacteria on their teeth and claws, which can be deadly to birds. One little scratch from a cat can make a bird very ill, perhaps even die, within 48 hours. Any suspected run-in with a cat should be considered extremely serious and requires medical attention. Snakes Snakes are the natural enemy of birds. A snake should be kept as far away from birds as possible. Ferrets Ferrets are also very hazardous to birds and should be kept in a separate area. Rats, Rabbits & Other Furry Critters: Most “critters” aren’t dangerous to birds, but they do carry Pasteurella bacteria, which is deadly to birds. Fish The fish aren’t a problem, but the water is. Keep all fish tanks and bowls covered. A bird might crash-land into a tank or attempt to bathe in the water and drown. If you’re traveling by air, make sure you have an airline-approved carrier that will fit under your seat. Do not put your bird into cargo! Call your airline when you book your ticket to ask about its bird policy. Some airlines no longer accept birds in the cabin, so don’t get stuck at the airport! Book your bird onto the flight when you make your reservation. Most airlines have limit on how many pets they take per flight, so make sure that your bird has his flying papers. Your bird will be required to have a recent certificate of health issued by a veterinarian in order to travel. Do not forget to take your bird’s health certificate with you. You will not be allowed on the plane without it. If you are traveling by car, your bird should always be in a carrier. If you can’t get the safety belt around the carrier, use bungee cords to secure it to the seat. It’s very dangerous to allow your bird to ride freely in the car. Place your bird’s travel carrier in the back seat so that he is not in front of the passenger seat airbag. If you have to leave the car, always take your bird with you. The car may become overheated, or a thief may spot your bird and steal it. Birds are not allowed on Amtrak, but they are allowed on some local trains. Call to be sure and always have your bird in a carrier. The same applies for busses. Most birds are fairly calm inside the carrier, but some may panic. If you have a panicky bird, line the carrier with soft towels to avoid any injury from thrashing. Line the carrier with paper towels. Put your bird’s favorite food inside the carrier along with a shallow dish of water or a water bottle (if your bird knows how to use one). Or, you can include a dish of cut fruit, like apples and oranges, so that your bird can get moisture from them. If the trip is long, check on his water often to make sure that it hasn’t spilled. It’s a good idea to clip your bird’s wing feathers before the trip in case the carrier opens. Try to keep an eye on the bird and call for him to come down from wherever he has perched, usually a tree or other high spot. If you can, call someone to come outside and bring you the bird’s food container, or something else the bird likes. If you have to get it yourself, move quickly. Try to call the bird down using the food. If that doesn’t work (and most of the time it doesn’t because the bird is scared or distracted), go inside quickly and get the bird’s cage, or any cage, and the bird’s friend (another bird) if he has one. The other bird will call to his friend to come back. Prop the empty cage door open and put food and water inside, then sit back a few feet (maybe out of sight) and wait for the bird to come back. If he does, rush over and shut the door. If your bird is friendly, try climbing a ladder as close to it as possible and lure him down with food. If you can’t get your bird to come down, wait until nighttime when the bird will have to find a roost. If you know where the bird is when darkness falls, then you can use a ladder to reach him — grab him very quickly or use a net so that he doesn’t go flying off into the darkness. If your bird has flown out of sight, get in your car and drive around looking for it. Do anything possible to locate it in the daylight hours. If you can’t find your bird, immediately call all of the local animal shelters, veterinary offices and pet stores, and inform them about your lost bird. Someone may find your bird and take it to one of these places. Make up flyers with your bird’s photo, a brief description of your bird, and offer a reward (but don’t say how much the reward is). Post the flyers in high-traffic areas within a 10-mile radius of where the bird was lost. As a preventative measure, if your bird can talk, try to teach it your phone number; it’s a long shot, but it may help to bring the bird home if it is lost. You can also make a recording of your bird’s vocalizations and play it outside if your bird is lost — the sound may bring him back. Make sure that your bird is microchipped and that the chip’s number is registered in a database. Microchipping is usually done on larger parrots, so smaller birds will generally not have this option. These days, most states require that all birds sold be “closed banded,” meaning that a small, metal band is placed by the bird breeder onto the bird’s leg when the bird is just a few days old. Some breeders don’t do this, especially with smaller birds, but most do band their baby birds, especially if they intend to sell the birds to stores or to the general public. Some breeders of small birds use a colored plastic band to identify gender or individuals. Closed-metal bands have several letters and numbers on them that you can use to identify your bird, and perhaps even find out where he came from. The band has a number unique to the bird; this helps the breeder keep records of all the babies. The band may have a state abbreviation on it, like TX or FL. The band may have the acronym of a bird club on it or an acronym of the aviary’s name. Most bands have a year on them so that you know when your bird was hatched. If you can’t take your bird with you when you travel, you will need a competent bird sitter. Perhaps a friend, relative or neighbor will agree to bird sit for you, or perhaps you’ll hire a pet sitter to watch your feathered friend. Here are some tips for choosing and instructing a bird sitter. Find someone who knows something about birds. The sitter doesn’t have to be a bird expert, but he or she should have cared for birds before and be familiar with what they need. If you hire someone, make sure that they are licensed and bonded (insured) and that they already have bird clients. Ask for references from other bird owners, and follow up on them. Leave enough food and medicine for your bird for double the time you’ll be gone. You never know if you’ll be delayed, and you don’t want your bird sitter to play a guessing game about what your bird needs. Leave detailed instructions about feeding, watering, cleaning and your bird’s lighting needs. If you can, put lighting and the radio/TV on a timer, but ask the sitter to check it every day to make sure the timer is working properly. Leave the sitter all of your contact information and your veterinarian’s contact info. Ask your veterinarian if you can leave your credit card on file in case there’s a problem and the bird needs to be seen. Call the sitter at least every other day to check on your bird. Before you leave, give your bird some extra toys that you know are safe, and remove any toys that need maintenance, like cotton rope toys or huts. One entire cupboard is designated for Ziggy’s stash, which includes some of his favorites…. Nutri-Berries, Garden Veggie Nutri-Berries, (we let him pick which color he wants for himself, which can be dangerous as he grabs the tray they are packaged in & hangs on for dear life!) and his new all time fav Nutri-Berries Featuring Popcorn! Thank you again Lafeber for providing our Ziggy with great choices in nutritious treats! Thank you for the samples that you sent me, they arrived safely last week and I thought I would send you a picture of one of my birds. This is Harley, she is only six months old and loves your treats. My other conure, Ziggy, was a little camera shy that day and kept flying off.Thanks again! We have an African Grey (Chloe) that is such a picky eater. Since I’ve been giving her all the flavors of Nutri-Berries and Avi-cakes I have no problem with her eating. I have ordered the Premium Daily Diet also and I’m hoping she will like that too. She loves all your products so far and I see you have Popcorn Nutri-Berrie Treats. I’ll try that on her when I order again.Tell Dr. Lafeber He’s the best!